I was feeling a little apprehensive about one particular item in our Belize itinerary: Actun Tunichil Mucknal (ATM for short). ATM means the Cave of the Crystal Sepulchre in Mayan. 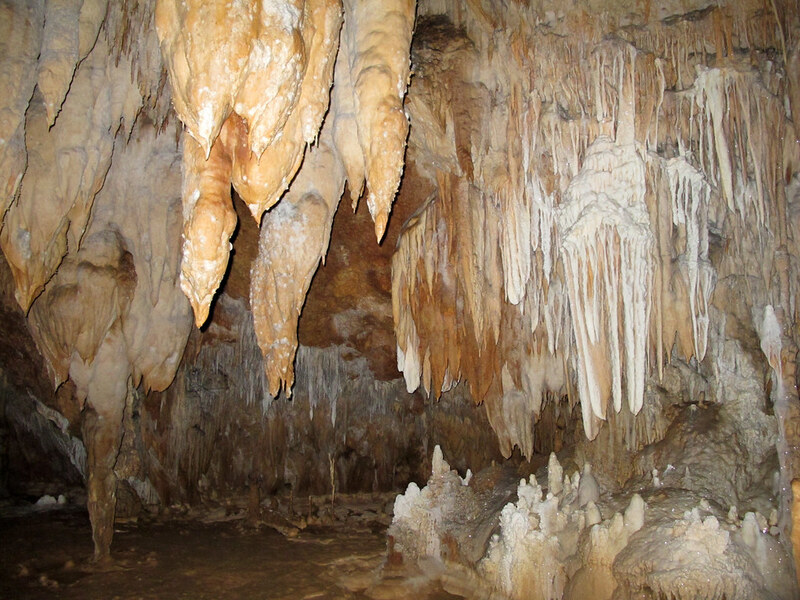 This cave is not only a beautiful natural feature of the landscape but an archaeological site. National Geographic rates it as one of its top 10 sacred caves of the world for its importance to the ancient Maya. It sounded cool, but I had so many questions: Will my mild claustrophobia raise its ugly head? Will I be cold? What should I wear? There wasn’t much information provided by tour companies in preparation for the tour, and having read reviews, I see some people were really taken by surprise. So, here is what you need to know before booking a tour of Actun Tunichil Mucknal. ATM was most recently discovered in 1989 by archaeologist Dr Jamie Awe and it wasn’t until 1998 that it opened to the public. 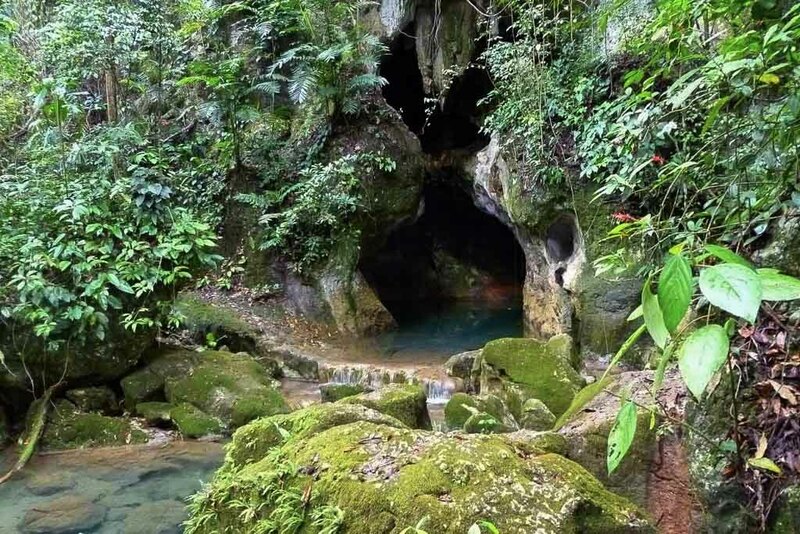 The ancient Maya believed the limestone cave was a gateway to Xibalba—the underworld. ATM was a place where they could be nearest to the spirits and only the most important people were allowed access to the Cave in order to perform rituals that included human sacrifice. Archaeologists have found and catalogued almost 1400 artifacts which include ceramics, tools and weapons that can be dated back to 250CE. 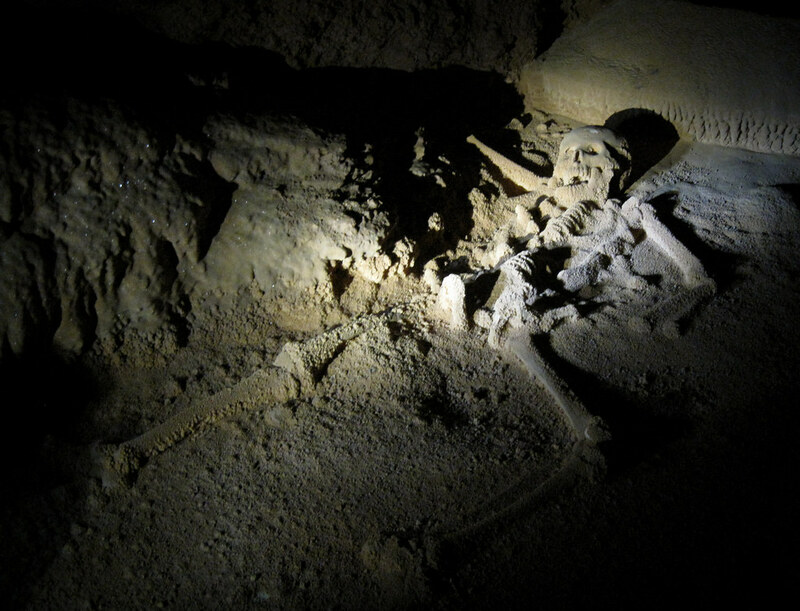 There are also 14 complete skeletons within the main chamber of the Cave. One of which is the famous “Crystal Maiden,” a young person of around 18 years old believed to have been sacrificed to appease the gods. At first, it was thought the Crystal Maiden was a girl, but new evidence suggests it may actually be a male. Most skeletons like the Crystal Maiden have been calcified to the cave floor and therefore can’t be removed and placed in museums. Beyond the human element of Actun Tunichil Mucknal, there are also glittering limestone walls, stalagmites and stalactites. The Maya sometimes modified these natural formations to create altars or to create shadows that resemble certain animals or figures. Fauna inside the cave includes bats, freshwater crabs, crayfish, fish and spiders. Actun Tunichil Mucknal is located about an hours drive from San Ignacio, Belize inside the Tapir Mountain Nature Reserve. We set out from San Ignacio around 9am and took the slow, bumpy road that leads to the rangers station at the beginning of the trail. There we met our guide, Danny, who kitted us out with helmets (our group was not offered lifejackets, but we all said we could swim). We are not allowed to take anything else bar a water bottle. Danny carries a drybag with medication, our headlamps and socks for those who want them—more on that later. Less than five minutes into the forty-minute hike to the cave entrance we encounter one of three river crossings along the way. This one is the deepest and you are required to swim about 20m across the river with the aid of a rope if required. There are “oohs” and “aahs” of surprise as the group enter the cold water. We continue on the jungle hike, crossing the river two more times at knee and hip depth, both with the aid of a rope. Once we reach the cave opening, all water bottles must be left behind for collection on the way out. Danny attaches headlamps to our helmets and leads us into the watery entrance of the cave. This requires another roughly 20m swim and there are no ropes. From here to the upper chambers we are consistently in water ranging from ankle to chest deep. We scramble over boulders and squeeze through tight spaces between rocks. We walk in single file, verbally relaying warnings and instructions from Danny down the group. Overall the cave feels quite spacious and my claustrophobia isn’t a challenge. On the day we visited the Actun Tunichil Mucknal was extremely busy. The Cave had been closed the day before due to a rise in water levels, and so there were many groups rescheduled from the day before. Sometimes this caused a traffic jam and we had to wait patiently while groups filed past each other one for one. Once we reach the upper passage, there is a climb upwards that requires careful foot placement and a ladder that must be scaled. 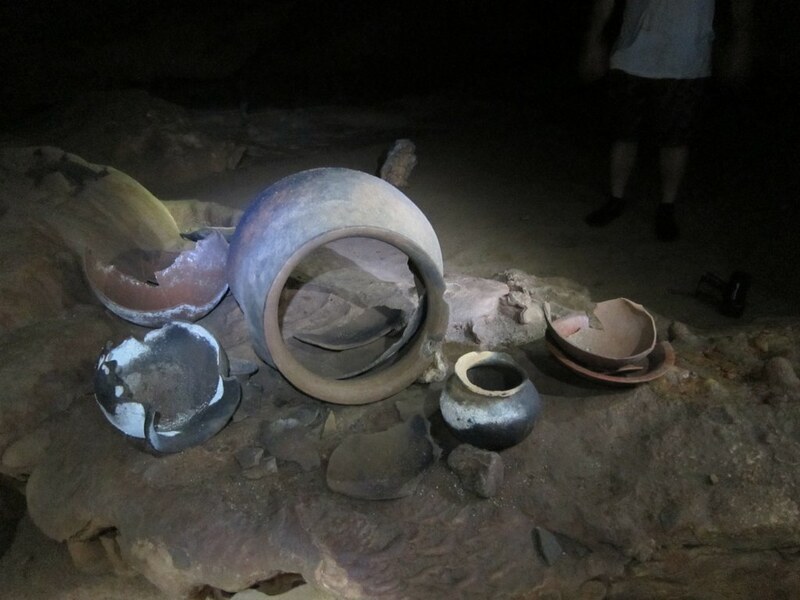 On these drier upper levels, we begin to see skeletal remains and pottery left behind by the Maya. At this point, our shoes must be removed to preserve the cave and its contents. Those who chose to bring socks, walk in those and others continue barefoot. Danny shines his flashlight at particular limestone formations showing us how they had been altered to cast shadows of jaguars and other silhouettes significant to the Maya. There is pink tape on the floor roughly denoting artefact locations and where not to walk. Danny also asks us not to step in the rock recesses and stay to the higher areas of the floor, as these holes may contain unearthed artifacts. Finally, after about two hours in the cave, we reach a dead end where the Crystal Maiden rests. I’m not going to lie, it was an anticlimax. The journey to reach the famous skeleton was far more interesting than the boney remains of one particular sacrificial victim. This was not helped by the fact I was finally starting to get cold from standing still while waiting for other groups to pass. The cave is surprisingly humid and as long as we kept moving I was warm, but with the extended stoppages I had begun to chill. My stomach was also starting to rumble, so I was keen to begin our return journey. Exiting the cave is much faster, as there are fewer stops for commentary and everyone has got into the rhythm of wading, scrambling, climbing and lending each other a hand. I counted down the river crossings on our hike out, as we had been wet for several hours and it was wearing thin. Upon reaching the ranger station again, I felt such a sense of achievement – it was a challenging, fun and interesting four hours that I highly recommend. ATM is a sacred site to the Maya past and present, so no swimwear/bare chests are permitted. The ideal clothing would be a rash guard and board shorts. I got by with a cotton t-shirt and quick-dry shorts over my swimsuit. I recommend long sleeves to keep you a little warmer and protect you from mosquitoes (insect repellant will wash off in the first river crossing but is good to have after the tour when you are eating lunch). Quick dry leggings are another good option. Wear closed-toe wet shoes/reef shoes or similar. You must be able to hike and swim in whatever footwear you choose. For those with sensitive feet, take socks for the shoes-off part of the cave and your guide will carry them in their dry bag. Keep in mind that whatever you wear on the tour will get wet. Take a full change of clothes, shoes and a towel for after the tour. There are bathrooms and change rooms available at the ranger station. No cameras are allowed. Years ago a tourist dropped their camera on a 1000-year-old skeleton, causing a gaping hole in the skull. Cameras and video equipment have been banned since. (All images in today’s post were provided by pre-ban visitors via Flickr). Everything that you don’t take with you on the tour will be locked in the car/bus in the carpark. Though the drivers are all hanging out there waiting with their vehicles for the duration, I would play it safe by not taking any unnecessary valuables. To keep pace and enjoy your ATM tour, you must be agile, able to swim and comfortable squeezing through tight spaces. There are no safety rails. This tour is not for people with any type of mobility issues. The hike to and from the cave is roughly 3km (40min) each way, with aforementioned river crossings. You will spend 2.5-3hrs in the cave. If you are travelling with children, there is a height restriction of 100cm (approx. 40in), some tour companies also set a minimum age of 10-years-old. My husband and I felt that the tour was not appropriate for a child this age/height, which was reinforced when we saw parents struggling with their young kids throughout the day. We would suggest no children under 13-years or 150cm (59in). 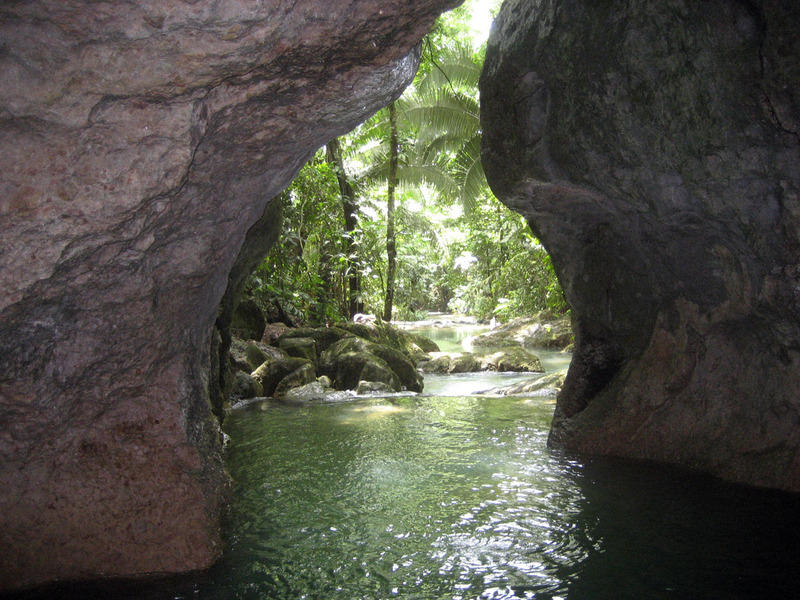 Hotels in the San Ignacio area can book a trip for you. There is a pool of 23 licensed guides who are trained and approved to take tours of the cave. Some own their own businesses, but most work for local tour agencies who make bookings on their behalf. Eat a big breakfast before you set out. Tours generally provide packed lunch and water at the end, as you will be starving when you are done. Check with your operator. The Cave may be closed for safety from time to time due to a rain induced rise in water levels (no one wants to go through the ordeal of that Thai soccer team). If you are travelling in wet season and are set on seeing ATM, then make sure you have a back-up day for your tour in case it needs to be rescheduled. Find flights to Belize with Skyscanner. If you are physically agile and have a sense of adventure, Actun Tunichil Mucknal is a challenging day tour that provides beautiful natural surrounds, and a fascinating insight into Mayan culture and history. After starting out with some trepidation, I felt a real sense of achievement having completed the spelunking expedition that was outside my comfort zone. A little more information before the trip would have helped to alleviate any pre-tour anxiety, so I hope this post will put your mind at ease and help you prepare for ATM. Please drop any questions you might have in the comments below. Feature image by Rubiessf via Flickr. Pin image by Antti T. Nissinen via Flickr. Wow this sounds like quite the adventure! I’d love to be exploring in such an interesting site, thanks for all the details on what to expect. Thanks Katie – it was definitely worthwhile pushing outside my comfort zone for this one. I just wish I had that little bit more info to prepare. Hopefully this is helpful to others!